The amount of heat that leaks out of the building, which you then have to replace with expensive heating (or cooling) is primarily driven by the fact that there’s a difference in temperatures between your house and the outside. (That’s why installing insulation saves you so much money!) 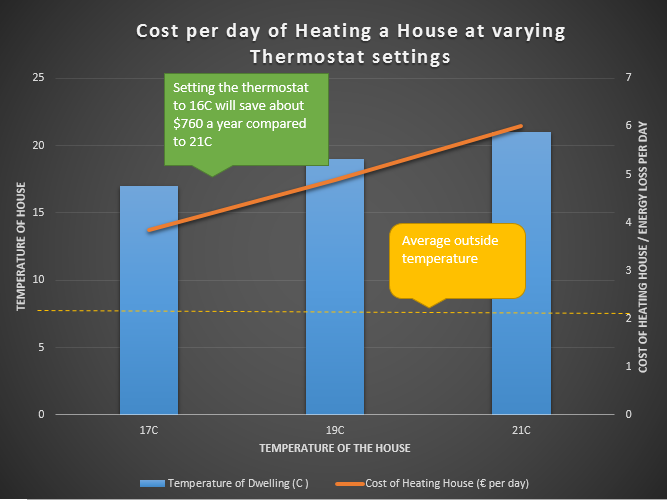 There is therefore one thing you can do to reduce this heating cost with no need to buy or install anything. If you’re walking around your house in mid-winter in a tee-shirt and shorts, we saw that you’re paying about $730 for the privilege – an average house is consuming about 20kWh more per day in winter at 19°C than it is at 16°C. Personally, I’m happy to wear a top in the house if it means being paid $730 a year, tax free. How do I work out exactly what I can save at what thermostat setting? To understand exactly what this figure was for me (a fairly typical three bedroom house), we need to delve very slightly into the maths of insulation and conductivity of a structure. A typical semi-detached building has a heat-loss parameter of 3.7 W/°C/m^2 . If the temperature is maintained at 19 °C for 24 hours per day, and the average yearly outside temperature is 9.8C (that’s the case for Ireland), the energy lost per day is 155 kWh/d. • At 19 °C, the heat losses per year are: 7.7 kWh/d/°C × 2866 degree-days/y/(365 days/y) = 61 kWh/d. • At a tropical 21 °C, the average rate of heat loss is 75 kWh/d. 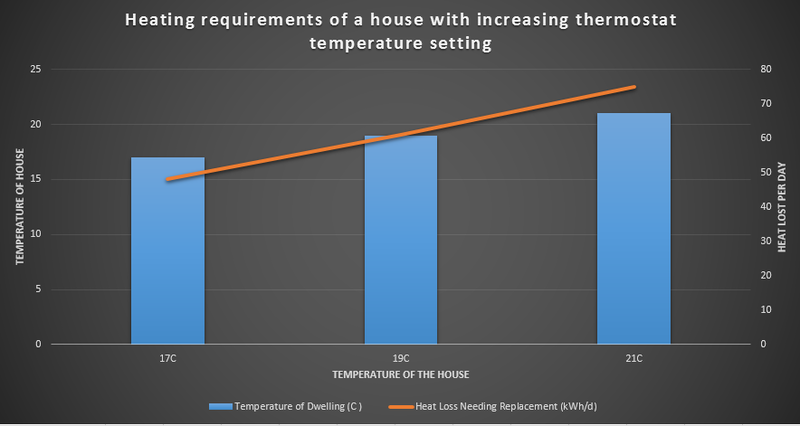 Turning down from 20°C to 17 °C gave a reduction in heat loss of 30%. This tells us that for each degree hotter we heat the house in comparison to the outside, it’s costing a disproportionately larger amount to achieve that heat. So there you have it – turn down the thermostat to 17°C and become a Heat Model: Get Paid to Wear a Jumper to the tune of $730 tax free a year!